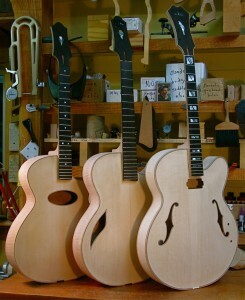 Getting three guitars ready for finishing. These three couldn’t be less alike. An oval hole Macceferri-inspired archtop for a customer in Texas, a 7-string Northern Flyer for the great Brazilian guitarist Swami Campos Jr. and a custom 17″ for jazz guitar great Tony DeCaprio in France.